The Video Electronics Standards Association (VESA) is a non-profit organization that provides product standards for a number of industries under the general banner of technology. This organization creates, for instance, standards for devices used to mount flat screen televisions. The size of VESA screws required on a VESA-approved wall mount depends upon the weight of the television and what the VESA mount can hold. VESA provides three standard measurements for all flat screen mounting screw requirements: length, diameter and pitch. VESA provides all standards for wall-mount televisions under its Flat Display Mounting Interface (FDMI) heading. For VESA, FDMI constitutes something of a catchall phrase that describes the basic requirements for all types of mounting devices for flat screen televisions and computers. The VESA standard dictates the placement of the hole pattern on the back of displays and the screws used to fit into those holes. For VESA wall mounts, the hole pattern should be centered on the display's back. Having the center-positioned pattern minimizes torquing (a twisting force that tends to cause rotation) forces applied to the mount. This allows the VESA wall mounts to hold a heavier load. Types of mounting devices covered by VESA FDMI standards include desktop flat screen mounting arms, overhead mounts, poles, pivots, arms, mobile mounts and wall mounts. VESA provides two sets of standard sizes for wall mount screws, those for screens weighing as much as 110 pounds and those weighing more than 110 pounds. When you're trying to figure out how to determine the screw size for VESA wall mounts, you have to take into account the length of the screw. The length of the screw will vary depending on the metal's thickness on the wall mounts. VESA certified wall mounts come packaged with all the screw sizes, lengths, spacers and washers that should be used when mounting what you need. Screws for screens that weigh 110 pounds or less must have a minimum diameter of 6 millimeters (1/4-inch) and a pitch of 1.0. Pitch in this instance refers to the number of ridges on a screw per unit of measure — in this case, millimeters. These screws must have a threaded length of at least one and a half times the diameter of the screw — the threaded length excludes the length of the screw head and any anchor the screw may have. VESA recommends a standard screw length of 12 millimeters (1/2-inch) for this category. For televisions that weigh more than 110 pounds, VESA requires a minimum screw diameter of 8 millimeters (1/3-inch) and a pitch of 1.25. 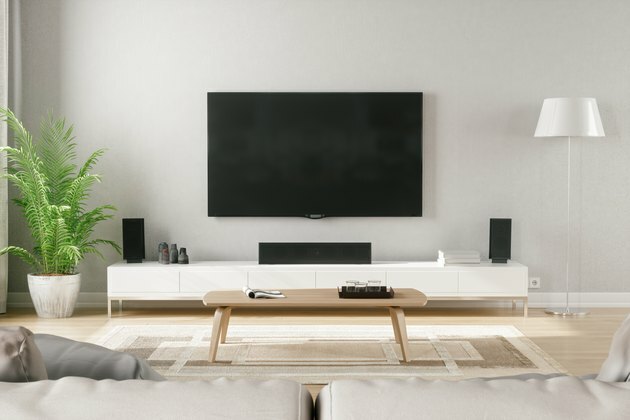 As with standards for televisions that weigh 110 pounds or less, VESA requires a minimum thread length of one and a half times the diameter of the screw for mounting screens that weigh more than 110 pounds. The organization recommends a standard length of 16 millimeters (.63-inch), though manufacturers may determine the exact length themselves so long as it conforms to standards. As long as manufacturers stay within the minimum standards set by VESA, a VESA wall mount can come with any number of screw sizes. For instance, a Sony television that weighs 66 pounds comes with 16-millimeter-long mounting screws that conform to VESA standards. These screws exceed the minimum length for televisions that weigh 110 pounds by 6 millimeters. If you already own a wall mount but need the screws for it, you can use VESA standards when purchasing your screws or contact the wall mount manufacturer for information on recommended screws.